Rocko‘s second entry in the FBTB Steam-Wars contest (following on his world-famous TIE fighter) is an excellent speeder bike. The boiler is simple yet effective, and the multiple propellors (for lift and forward propulsion) give this classic Star Wars vehicle a truly steampunk flair. Incidentally, We both came up with the front end design independently. Perhaps great minds think alike? 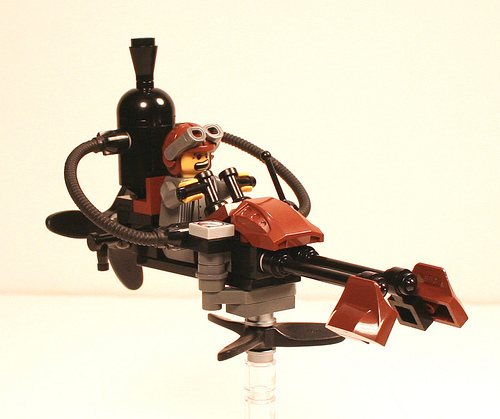 Pingback: The Brothers Brick - LEGO Blog » Blog Archive » The lightest speeder in the outer rim!